Just a few simple steps away. Fill out the checkout form and your order will be on the way in no time. 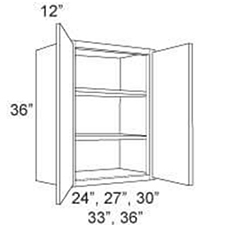 All cabinet images show face-framed cabinets and are for dimensional and functional representation only. All cabinets are built in the frameless, also known as a European-style, cabinet and have no face frame. The door, hinged directly to the cabinet box, forms the entire cabinet front. Benefits of this style include more streamlined appearance and a more efficient use of space, with ergonomically designed moving components such as drawers, trays, and pull-out cabinets providing better access to interior components.